A new polar-class logistic support tanker for the Royal New Zealand Navy (RNZN) will be the first naval vessel to feature the Rolls-Royce award winning Environship design with wave piercing bow. It will replace HMNZS Endeavor, which has been in service for 30 years. 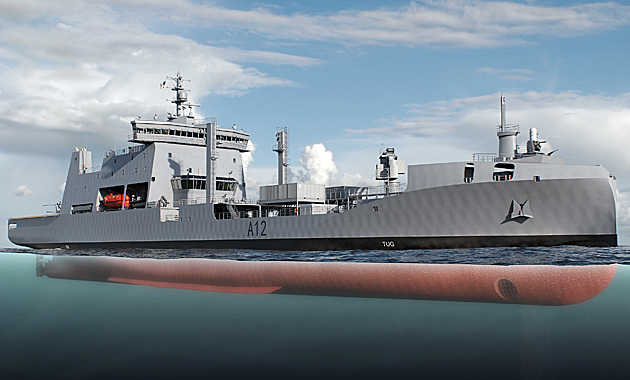 Artist impression: The future ice-capable naval tanker of the Royal New Zealand Navy. Under the contract, Rolls-Royce will also supply a wide range of equipment. A combined diesel electric and diesel (CODLAD) propulsion system, with two Bergen main engines driving CP propellers through a reduction gearbox. Four MTU high speed diesel gensets will supply electricity for the vessel and other equipment that includes bow thruster, the all-electric RAS/FAS system, other equipment includes rotary vane steering gear with rudders and the propeller shafts. Significantly larger than the ship it will replace, the electric RAS/FAS system allows simpler and quieter replenishment/fuelling-at-sea operations and will enable the tanker to refuel two ships at a time while underway. It will also carry and refuel Defence Force helicopters, produce and store water and transport bulk goods to bases in Antarctica during the summer months. “We see significant value in the Environship concept in the naval sector”, says Sam Cameron, senior VP naval sales and business development at Rolls-Royce. “Securing this milestone contract for a naval application is important in showcasing our naval ship design offering. The 23,000 tonne tanker will carry out operations in extreme Antarctic conditions and is strengthened and winterised to Polar code 6 requirements. Used under licence the Rolls-Royce Environship concept design will be built by prime contractor HHI as part of the New Zealand Defence Force’s Maritime Sustainment Capability (MSC) project. Working to an ambitious time-frame equipment will be delivered to the South Korean builder from 2018, with vessel delivery scheduled for 2020.